Colby R. Keistler, Emma Hammarlund, Jacqueline M. Barker, Colin W. Bond, Ralph J. DiLeone, et al. Relapse is a persistent risk for abstinent drug users, including alcoholics. It is often triggered by exposure to cues or environments associated with drug use. The neural bases of drug addiction and relapse have been elucidated in rodents, which are trained to press a lever to receive a drug, after which lever pressing is extinguished by ceasing drug delivery and then reinstated by presenting drug-associated cues. Such experiments have identified the medial prefrontal cortex (mPFC), basolateral amygdala (BLA), and nucleus accumbens (NAc) as essential for drug-related behaviors. Because these areas have numerous connections with each other and with other brain areas, however, how they interact to influence drug-seeking and extinction has been unclear. To address this, Keistler et al. developed a technique to kill neurons that project from mPFC to BLA, from mPFC to NAc, or from BLA to NAc in rats. Virus containing floxed diphtheria-toxin receptors was injected into mPFC or BLA, and a retrogradely transported virus containing Cre recombinase was injected into a target area. This caused diphtheria-toxin receptors to be expressed only in neurons that projected to the selected target. Thus, subsequent administration of diphtheria toxin killed only these neurons. The toxin was administered after rats had learned to press a lever to receive alcohol to investigate the effects of specific projections on extinction and reinstatement of alcohol seeking. Ablating neurons that project from mPFC to NAc had no effect on extinction of lever pressing, but it impaired cue-induced reinstatement. In contrast, ablating neurons that project from mPFC to BLA did not significantly affect extinction or reinstatement. Finally, killing neurons that project from BLA to NAc did not affect extinction of lever pressing, but it impaired extinction of approach to the alcohol-delivery site, and it impaired cue-induced reinstatement of lever pressing. These results suggest that both mPFC and BLA regulate cue-induced reinstatement via projections to NAc. This is consistent with the role of the NAc in driving motivated behaviors. More broadly, the work demonstrates the value of combining Cre-dependent expression of diphtheria-toxin receptors and retrogradely transported Cre-expressing viruses to elucidate the functions of specific neural pathways. Most people can easily tap along with an ongoing beat and continue tapping at the same frequency when external cues stop. This ability—particularly the ability to continue tapping in the absence of cues—depends on neural activity in the medial premotor cortex, which is thought to encode elapsed time between taps. How neurons represent timing information remains unknown, but several computational models have been proposed. These include drift-diffusion models, in which information accumulates over time until a threshold is reached, at which point an action is initiated. According to these models, differences in response times can occur if either the accumulation rate or the threshold changes. The ability to tap in rhythm depends on activity in the medial premotor cortex. See Merchant and Averbeck for details. 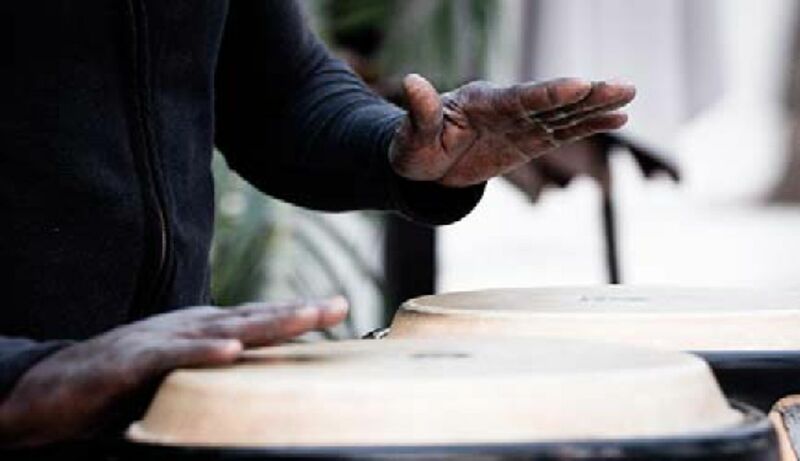 “Hand drumming” By Hernán Piñera from Marbella - Timbal, CC BY-SA 2.0, https://commons.wikimedia.org/w/index.php?curid=45183912. To determine whether a drift-diffusion model might be used to encode elapsed time in the premotor cortex, Merchant and Averbeck trained monkeys to perform a synchronization-continuation task, in which animals tapped in synchrony with a cue and then continued to tap after the cue stopped. They found that the mean and standard deviation of the time intervals between monkeys' taps, as well as the distribution and other statistical features of the intervals, were consistent with the predictions of a drift-diffusion model. The authors then recorded neural activity in the medial premotor cortex as monkeys performed the synchronization-continuation task, and used a decoding algorithm to estimate elapsed time between taps using population activity. Estimated elapsed times were generally consistent with actual times; but at the beginning and end of trials, the decoded times were sometimes shifted earlier or later than the actual time, suggesting the time counter did not always reset precisely when a tap occurred. Notably, during the continuation phase of the task (when no external timing cue was present), if neural activity suggested more time had elapsed then actually had, the monkeys tended to tap prematurely, whereas when the decoder lagged actual time, the tap was late. These results are consistent with the drift-diffusion model and suggest that population activity in the medial premotor cortex keeps track of elapsed time between actions in a rhythmic tapping task. With each tap, the internal timing mechanism resets, but resetting of the clock sometimes occurs somewhat before or after the tap occurs. Future work should investigate how the premotor cortex interacts with other components of timing circuitry to represent time across behaviors.